Stephanie Pellegrin from Stephanie, A History and I had the pleasure of delivering all of the awesome books collected from the TX book blogger holiday party. Yes, it took us awhile, but we were able to gather more books to donate since the party. After much consideration, we settled on the Austin Children's Shelter for our donation. Janice is the coordinator of in-kind donations. We contacted her a few weeks ago and she was happy to have the donated books. When we arrived, we were excited to see that they had a cute little library! There were plenty of children's picture books and early chapter books, but not a lot of YAs. Luckily, we had those! Stephanie and I had a great talk, and learned about the awesome facility and services they provide to children. Currently, they have almost 50 residents. These children, that range from infants to 20 years, were taken away from their parents for one reason or another, or were homeless. They had a wonderful playground and the cottages looked so warm and cozy. The Austin Children's Shelter looked like an inviting home for any child. I was absolutely blown away by house nice the shelter was! After our tour, Stephanie and I filled the shelves and snapped a picture! 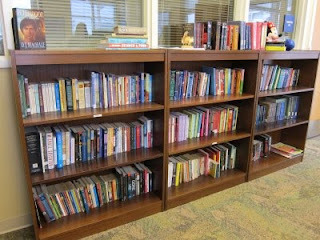 All of those books look so terrific in their new home! All together, we were able to donate around 50 books to the shelter. Janice was so nice and appreciative that we would love to donate more! She said they are looking for anything Twilight*ish and fantasy. She explained, "They have forgotten to dream." Oh my gosh, I just about cried my eyes out. These teens need a reason to come to the library and check out books. The shelter also encourages the children to keep their favorite book forever. Janice wants everyone to start their own personal library. How wonderful! The shelf in the above picture is the only area dedicated to teen books. They need more! If you are an author who would like to donate, please email me. We are happy to donate ARCs. If you live in TX and have books to donate, we make trips to Houston and Dallas regularly for author events. We would love to pick up your donated books. In fact, we will be in Houston January 21-22nd for the Montgomery County Teen Book Festival. Any donation would be welcomed! We will be making another trip in March. I would love to have at least 50 books for the shelter. Think about it.....if your cost of postage is a concern, email me.